We understand that obtaining a written certification can feel overwhelming; however, the process is actually very easy and straightforward. This section helps to simplify the process of becoming a patient in Maryland and will get you headed in the right direction. The first step is going to mmcc.gov to register online as a patient. You will be required to submit a photo along with your registration, so please see the following link for details: http://mmcc.maryland.gov/Pages/photo-requirements.aspx. After registering online, you will need to wait to receive an approval email from the Maryland Medical Cannabis Commission (MMCC). 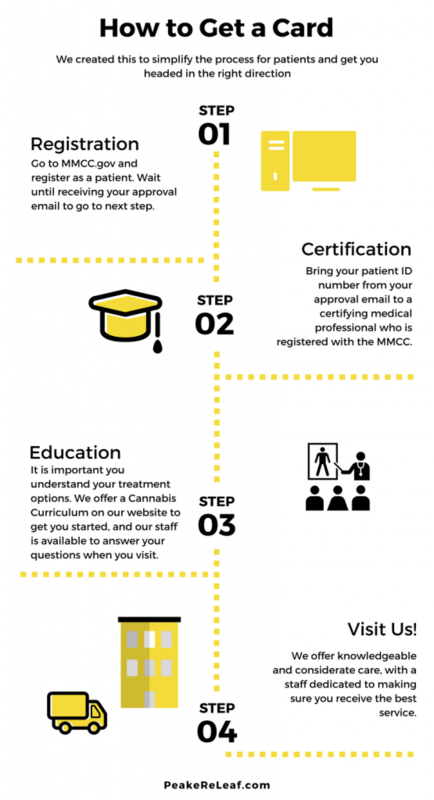 Once you receive your approval email, you must bring your unique patient ID, which is found in your approval email to a certifying medical professional who is registered with the MMCC. For more information concerning certifying medical professionals, please go to the MMCC website and review their provider information located here. Carrying a patient ID card in Maryland is optional. You may choose to log into the registry after receiving a written certification and order a patient ID card for $50. Be sure to have your credit or debit card available for payment. The patient ID card will be mailed to you following completion of this process. While it will be faster to check you in as a patient if you have your patient ID card with you, it is not required to receive medicine at Peake ReLeaf, although we do recommend purchasing one and keeping it on you at all times. Note: By law, minor patients are required to have at least one caregiver at all times. Those caregivers must either be the minor patient’s parents or the minor patient’s legal guardians and in either case, they must be 21 years and older. The caregiver is required to register with the MMCC prior to registering the minor patient. Additionally, the MMCC recognizes that any condition that is severe, for which other medical treatments have been ineffective, can be considered as well – if those medical conditions can be “reasonably expected to be relieved by the medical use of cannabis”¹. You can read more about each of these conditions right here on our website – here. ¹mmcc.maryland.gov. (2017). Patient FAQ. [online] Available at: http://mmcc.maryland.gov/Pages/patients_faq.aspx [Accessed 15 Oct. 2017].